John Fulthorpe, standing in for Chairman Allan White, welcomed Deputy Mayor Councillor Jill Green to open our 2017 Annual Exhibition of members work on Saturday 18th November. Helen White and Ruth Sheldon from Tyne and Wear Museums and Galleries were also in attendance. Paintings by Pat Thompson (Autumn Glory"), Jenny Dyson ("Shipley Gallery") and Allan White ("Fenwick's Window") were Highly Commended and Councillor Green presented the award to Jenny. Well done to all three. The members paintings were displayed, not on the gallery walls as usual but on easels arrayed at one end of the main gallery. Twenty one paintings were chosen for this area the rest were arranged in the side gallery on tables and seats, far from ideal. The work displayed on the easels will be removed after one week and replaced by other paintings. In this way all members work will be displayed in the main gallery at some time. Several sales were made on the day which is very encouraging however attendance was lower than in previous years. 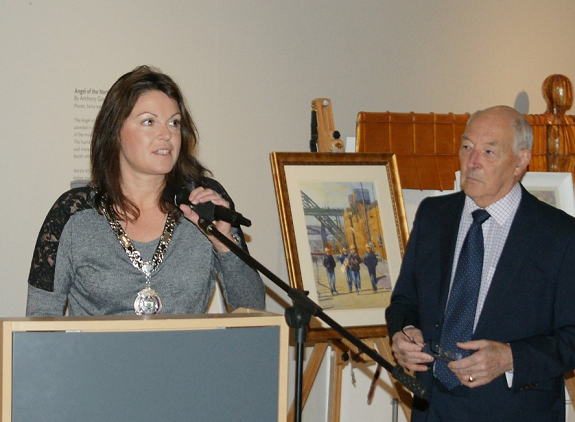 The 2016 annual exhibition of the Gateshead Art Society was opened at 11:00 on 12th November at the Shipley Art Gallery, where 80 works adorned the walls of gallery C.
The proceedings were opened with a welcoming speech from Helen White, the senior manager of museums from Tyne & Wear Museums and Archives service. This was followed by a short speech from Allan White, the Chairman and Secretary of the Art Society who thanked the T&WMA and particularly the staff at the Shipley for all their help in mounting the exhibition. He noted with sadness the passing of John McNally who had filled the role of Chairman for many years. The mention of the Gateshead Art Society achieving second place in the Art Club of the Year 2016 Award received warm applause from the large audience, particularly in view of the size of our Society compared with the opposition (see below). The exhibition was formally opened by Cllr. Allison Liderton-Thompson following the awarding of the Highly Commended prizes to Aubrey Anderson, Tim Griffiths and Karen Stott. Nearly 200 visitors enjoyed the exhibition on the first day and it continued to be enjoyed to it's conclusion at the end of January 2017. This coincided nicely with the start of the Shipley’s Centenary year, which also coincides with the 70th anniversary of the formation of the Gateshead Art Society. A total of 23 of the 80 paintings exhibited were sold. Gateshead Art Society were judged by international artist Hazel Soan as joint runners up in the "Art Club Of The Year" competition which was held at Patchings Art Centre, Calverton, Notts. The competition was hosted by The Artist Magazine and sponsored by Jackson Art Supplies. The Society's winning paintings were featured in The Artist and in Leisure Painters magazines. About a hundred art clubs took part, the top ten clubs were selected to display their work at Patchings Art Centre, where the final judging took place. Fifty paintings were exhibited as part of a four day festival of art that is an annual event at Patchings Art Centre. Leicester Sketching Club were the winners and Guildford the other runner up. 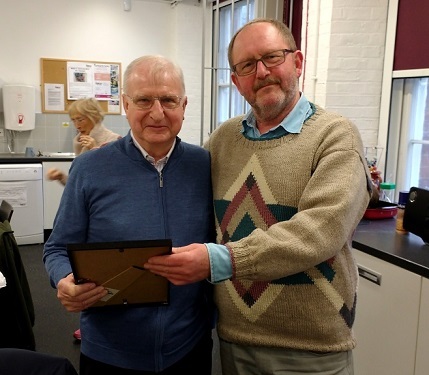 Society Chairman, Allan White, presenting a Life Membership certificate to Joe McGregor in recognition of his work for the Society as secretary, member and artist over many years. On the 25th September 2015 Clare Money was again at the Shipley Art Gallery. 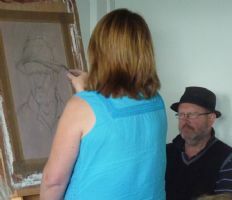 This time Clare was asked to demonstrate painting a portrait using pastels. As can be seen left, Clare painted an excellent portrait of Society Chairman, Allan White. While Clare was painting she gave a running commentary describing the methods she uses when painting with pastels. Proceedings were started by Helen White, Head of Museums, Newcastle & Gateshead who after a short speech handed over to Gateshead Art Society Chairman John McNally. After thanking Helen he introduced the Mayor of Gateshead, Councillor Neil Weatherley and his wife Mrs Lynne Weatherley. Before opening the exhibition, the Mayor who had earlier had a preview of the exhibition, praised the high standard of the exhibits. Society chairman John McNally then asked The Mayor to present certificates to three members of The Society who's work had been highly commended. The Exhibition opened on Tuesday 1st July 2014 until Tuesday the 5th August 2014. Society is based in the Shipley Art Gallery where they have an exhibition every November & December. Both exhibitions offer works for sale. Due to a major national touring exhibition being held in the Gallery for the latter part of 2009, the Art Society exhibition took place in February and March 2010. It was opened formally on the 13th February by the Mayor of Gateshead, John Eagle, who went as far as to buy one of the paintings. The exhibition attracted a large crowd that day and the public visitors to the gallery continued to enjoy the display for the duration of the exhibition. There were 113 works of art displayed and 47 were sold - a very creditable performance to all concerned. The 2010 exhibition will take place in the Shipley Art Gallery from 20th November 2010 until the 9th January 2011.